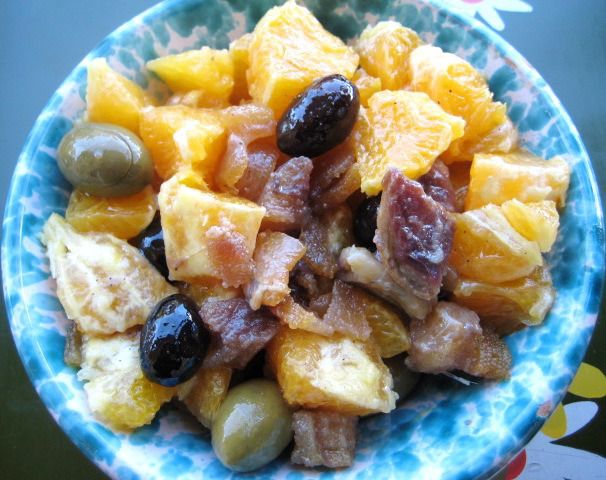 There is a particular salad that, for the Palermitani (the people of Palermo) is the typical appetizer during festive periods: Orange salad with herring. The sweet and succulent orange, the colour of the setting sun, is the fruit that has, for many years, been known as “Conca d’oro”, which literally means “valley of gold,” which name comes from the past, when Palermo, when seen from above, was surrounded by orange and lemon trees, countless beyond belief, a name that now seems ridiculous, as all that wonderful gold has now been replaced by the grey, wild concrete jungle we know of today. This delicious fruit, suitable as part of a hearty breakfast, and appreciated as a conclusion to our meals, has an even more sublime taste if eaten with salty, smoked fish. The Arabs imported oranges into Sicily in the twelfth century. From the combination of this sweet fruit, with salted fish or smoked in one of Palermo’s markets, was born a dish as mysterious and irresistible to which Italy’s culinary philosophy is based on (and not only) of the harmony between contrasts, typically Sicilian. In the past, Palermitans stored the large amounts of fish they caught, they used salt, as it was cheap. Sottosale (under salt) was used for sardines, anchovies and cod, whilst the herring (from Northern Europe) was instead smoked. All of these products were sold (just like today) in the markets by “u saliaturi,” specifically with regard to herring. From ”aringaru” (the men who dealt with the herring) who expertly used to remove the spine from the central herring, then the skinner who skinned, then wrapped them in newspaper to sell to customers. Herring has a very strong taste that the orange helps to control. It’s meat so tasty, with a part that is considered a true delicacy, a special mouthful: The egg, that isn’t always found if, as you can imagine, your herring is male. This heavenly mouthful is like a unity of infinitely amber-coloured bubbles, whilst the taste can not be described. You simply must try it. Herring, united in a happy marriage with orange, with added onion and olives, seasoned with extra virgin olive oil, salt and pepper, is a cheap food, but ever so rich, and your palate will be gratified like never before. However, pay attention! For an elder once said: “An orange in the day is gold, but in the evening it’s lead.” According to this idea, you should avoid eating oranges in the evening, and furthermore, if you add herring, indigestion is certain! But, as I had a great-grandfather who ate an orange every evening and lived to be ninety-two years old, I don’t trust this popular saying! Caponata is one of the most noted Sicilian dishes, as are all the variants, as every region has it’s own particular interpretation of the classic. The caponata of Monsú (the French chefs who were in Palermo in the 19th Century) was most likely made with fried dolphin meat, then served with a sauce of celery, olives, capers, onions and sweet and sour tomotoes. 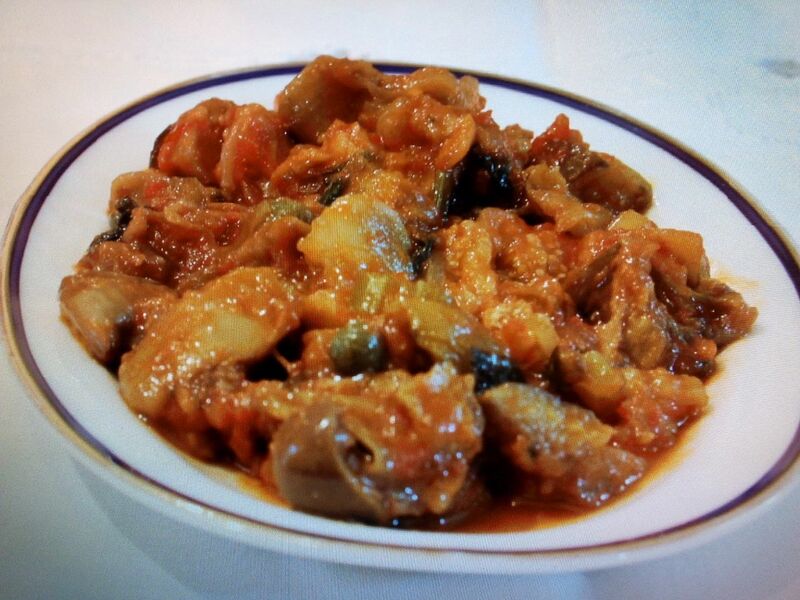 The “poor person’s caponata” however soon became, and still is, one of the most popular Sicilian dishes, which replaces the dolphin meat with aubergine. -Peel and cut the aubergines into small pieces. -Put the pieces in a bowl of salted water and soak. This removes the bitterness. -Slice the onion thinly and fry in olive oil. Then add the tomato sauce. Do not overdo the tomato sauce. A caponata shouldn’t be blood red, but darker. -In the meantime, remove the stones from the olives, (if they have them) cut the celery into small pieces and rinse the capers. -Boil a little water, then add the olives, the celery and the capers to it. When the celery is soft, remove the ingredients from the water and add them to the tomato sauce and onion mix. Stir and let it all cook together on a low heat for a few minutes to combine the flavours. -Meanwhile, remove the aubergine from the water and dry it on kitchen paper. Leave to dry. -Continue to simmer until the vinegar has evaporated. -In a clean pan, heat some olive oil, then fry the aubergine. When fried, remove from pan and put aside. -The aubergine should only be combined with the tomato mix when the tomato mix and the aubergine is cold. If serving immediately, layer the tomato sauce mix and aubergine. Alternatively, mix and store in a jar.